An eccentric girl who is the main love interest of Onodera Punpun throughout the manga. After many years without meeting up with Punpun, they encounter at a driving school and start seeing each other more often. Little by little, they open up to each other to eventually reveal different truths about each of their realities. She tells Punpun how she's fed up with the poor lifestyle of hers because of her crippled and cult-obsessed mother. In a rush to leave her house along with Punpun, they decide they should at least let her mother know. While in her house, Aiko's mother becomes enraged with the news and attacks Aiko with a knife several times, the biggest wound being around her abdomen. Filled with anger, Punpun assaults Aiko's mother and strangles her to death. They later run off to several places with the intention of starting things over. Through a series of events and dialogues, both Aiko and Punpun start to lose their composure and right thinking, trying to kill each other several times. On a morning, Aiko wakes up to leave a sleeping Punpun alone and hangs herself with a rope. 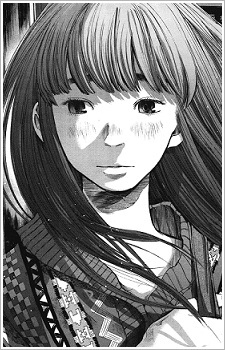 While Aiko and Punpun are running away, she reveals to him that after he strangled her mother until apparent death, she was still alive and that it was her that gave the final blow by stabbing in her stomach to death with a knife.